Great Grey Shrikes are scarce winter visitors to the UK from northern Europe involving perhaps under a hundred individuals. Although they arrive mainly in November and depart in late March to early April, I have always found them to be easiest to find in March, whether this is due to additional birds that have wintered further south passing through the UK or is merely an artifact of my birding schedule is open to debate (earlier in the year I might be looking for wintering wildfowl, later for spring migrants on the coast). I have seen at least one Great Grey Shrike annually in all but seven years since I first moved to Dorset in 1978 (although many of those were in the New Forest), almost always on heathland or young conifer plantation. They can however be very hard to pin down, showing well for while then flying a long distance to the next feeding area, or seemingly disappearing for long periods only to emerge on top of small conifer for all to see. Such was the bird that has been hanging around the Sugar Hill area of Wareham Forest. Today I made my fourth visit to the area and after an hour or so of searching saw it well. Great Grey Shrike complex has a circumpolar distribution (known as Northern Shrike in North America) with some populations reaching as far south as the Sahel region south of the Sahara. However there have been several recent attempts to carve it up into a number of species. First all the southern forms were split off as Southern Grey Shrike, then the Iberian population was found to be genetically distinct and considered a full species by some, then the migratory population of Central Asia was split as Steppe Grey Shrike and most recently a completely different arrangement based on molecular methods has been proposed (but not yet universally accepted as the genetic groupings do not correspond to plumage characteristics). Currently the IOC, whose list I follow, accepts just three species, Great Grey/Northern, Southern and Steppe Grey, but fortunately I have see all the proposed ‘species’ in that study! Wareham Forest is a large area of coniferous plantation to the west of Wareham that was first planted after WW1. After widespread harvesting now contains a lovely mosaic of habitats, small areas of deciduous woodland, heathland and boggy area that were never planted, cleared areas and recently replanted conifer belts. Great views over the forest can be had from the Iron Age hill fort of Woolbarrow. 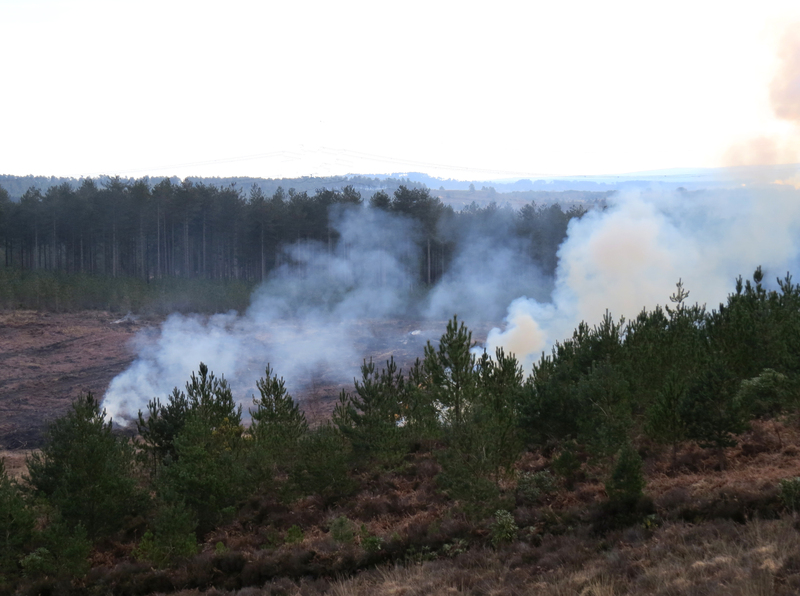 Rotational felling and in this case, burning of the brash, has given Wareham Forest a wide diversity of habitats. In other cleared areas the brash still lies on the ground …. … such as the area known as Oak Hill (not that there are many oaks there now) where I finally caught up with the Great Grey Shrike. I watched it for a while then it vanished only to return a short while later with a Sand Lizard in its bill, a bit of a conservationists nightmare as the Sand Lizard is an endangered species in a UK context. Unusually for a passerine, shrikes are predators of lizards, small birds and even rodents as well as large insects. They often store their prey on thorn bushes (these days often on barbed wire) earning them the colloquial name of ‘butcher birds’ or as Margaret calls them ‘jacky hangman’. I later called into our ringing site at Holton Lee to collect a few guy pegs I had left in situ as we don’t intend to ring at this site again until next autumn. A herd of Sika were grazing on the edge of Lytchett Bay. There were plenty of birds still visiting the feeders including this Goldfinch and also a number of Lesser Redpoll. A year or so ago I was sent a link to a cabaret act called Fascinating Aida, three ladies who sing some very amusing, yet risque song with lovely harmonies. Some of the songs were absolutely hilarious so when we found they were playing in Bournemouth we had to go and see them. See http://www.fascinatingaida.co.uk/ but beware that they use a lot of ‘adult humour’. Check out their song ‘Cheap Flights’ on the link below. http://www.youtube.com/watch?v=l6pj3Fdbwng They concluded the set with a song about Bournemouth which included the wonderful line that ‘[Bournemouth] has seaside oceanarium, its not the same fish, ‘cos sometimes they vary ’em’ By the way I had to do an update to the WordPress software and now I am back with the situation of having pictures that either too small or too large. As the Fascinating Aida photo isn’t very sharp I’ll keep it in the ‘too small’ category. Over the last couple of weeks I have done a few ringing trips. At our site at Fleets Lane all the wintering Chiffchaffs have gone but some new birds have arrived, all with pollen stuck above the bill, probably picked up on migration in Spain. Recently I have paid a few visits to Wareham Forest. A very visible pair of Lesser Spotted Woodpeckers were found in the Sherford Bridge area whilst I was away. On my return Margaret and I eventually obtained good view of the male in flight, but didn’t get any photos. I made three visits to the Sugar Hill area (above) in the hope of finding a Great Grey Shrike that a number of birders had seen, but drew a blank each time. Middlebere near Arne in Poole Harbour can be an excellent place to see raptors but only Buzzards were on show when I visited last week. Clearance of pines on the ridge overlooking the marsh has allowed these improved views. I had just got in the hide at Middlebere when this herd of Sika Deer ran past just in front of me, leaping over a barbed wire fence in the process. Thirty seconds later I would have been sat down with the camera ready and could have caught them mid leap. A group of six Spoonbills were asleep opposite the hide. Spoonbills were once a rare visitor to Poole Harbour but now can be seen for most of the year. It appears that ‘our’ birds breed in Holland, I wonder how long it will be before they breed in Dorset. On the 22nd I made a quick twitch to Weymouth in the hopes of seeing an Iceland Gull at Ferrybridge but had no luck. The run of dips continued on the 23rd when Margaret went first to the Balshford Lakes in hope of early migrants like Garganey, Sand Martin and Little Ringed Plover but only saw the regular duck species. Later we headed to nearby Ibsley Common to look for another Great Grey Shrike but merely got caught up in series of hail storms and got frozen by a bitter northerly wind. ….. however we did get to see a Red Kite and a flock of Fieldfares in this area. ….. and the skyscapes were very dramatic…..
….. but a few pairs of Mandarins on Eyeworth Pond was the only addition to the year list. I have just returned from a double trip to Mexico, a two separate trips taken back to back. The first was to the El Triunfo reserve in the southern state of Chiapas, close to the Guatemalan border. This huge area covers 120,000 hectares of montane forest and is completely undeveloped. For eight days we hiked from the east side of the park to the west, climbing up to 2200m and dropping down to a few hundred metres asl on the Pacific side. We stayed in basic accommodation at the park HQ for four nights and camped for three nights at three separate sites. It was a small group with just six clients, as well as leader Mark van Beirs we were accompanied by two local birders, Jorge and Amy. As this was a very important landmark for Birdquest, the 10,000th bird species ever to be recorded on one of their tours was expected on this trip, managing director Mark Beaman came along to document the event. Birding was great, I personally recorded 272 bird species or which 47 were ‘life’ birds. There were many highlights, two of which are shown below, others will follow in due course. El Triunfo early morning mists over the park HQ. It was wonderful to spend a week in these cool, moss covered montane forests. Apart from the buildings at the HQ we saw no evidence of human activity what so ever, no sounds from vehicles, planes, no localpeople, even no phone reception. The highlight of the trip came quite early, the first afternoon in fact. El Triunfo is the only accessible location where you can see the bizarre Horned Guan. This huge cracid was found making its deep booming call from a tree top at dusk. It was claimed that this was Birdquest’s 10,000th species but I have a sneaking suspicion that that was actually the unassuming Paltry Tyrannulet! The second tour was to the Yucatan peninsula. Mark and I flew to Mexico City and then on to Cancun where we met up with the rest of the group. Compared to El Triunfo, the contrasts in the terrain, habitat, physical effort, birds, group composition and level of isolation from the noise of the 21st century couldn’t have been greater. The Cancun and Cozumel area was particularly noisy, not only were they full of sun seeking tourists but it was the Mardis Gras festival and locals partied well into the night. No trip to the Yucatan would be complete without a visit to one of its famous Mayan ruins. Most tourists visit Chichen Itza (shown here) but we also visited Calakmul further south which is even more impressive and also has great birds like Ocellated Turkey and Great Curassow along the access road. This is only a quick overview of the two tours. I have over a thousand photos to edit but first I must prepare a talk for the Dorset Bird Club AGM in ten days time, so it might take a little while!